Actually, we are not going to eat them. And neither are the frogs! Our worms come to visit in a nice pail filled with composting soil - until the soil is spread over our tables and the worms are (gently) picked up and examined by the kidlets. We are extremely fortunate to have free recycling education from the Nanaimo Recycling Exchange. They bring worms and teach us about the important work that worms do to recycle our food waste into compost. One of the books that we enjoy is The Diary of a Worm. 1. The Earth gives him everything he needs. 2. When they dig tunnels they help the earth. 3. The Earth will never forget they are there. The book is funny, engaging, has attractive illustrations and introduces what worms do for the earth. That leads us to the important work worms do - composting. I love reading this book to the kidlets. The prose is gently rhythmical, a circular journey story that reinforces the great circle of life, and the pictures approachable, gentle and friendly. It's the time of the year that we get to explore life cycles and living things, plant seeds, get dirt under our fingernails and revel in the wonder of new and renewed life. 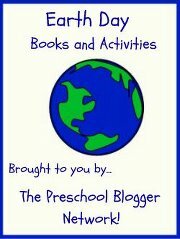 ps Check out lots of fabulous Earth day books and activities - and link up your own! I love the hands-on messy worms. I am your newest follower from TBTS! I don't think there's anything more apt than a blog post about worms for earth day! 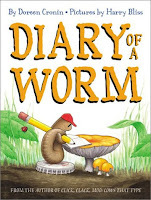 Thanks for posting and I too love the Diary of a Worm. Do you know the song "There's a worm at the bottom of my garden and his name is wiggly woo?" Juliet - thanks for the worm song and attitude test - I have not heard of either. I am going to check them out.